Whether you are a college student who’s facing sleepless nights and overdue projects or you’re a remote worker who spends at least 8 hours per day stuck on a chair in front of a computer, the importance of a good office chair is not to be taken lightly. One of the main things that you are taught about sitting at the desk is that it’s crucial to adopt a correct posture, as not to overstrain your spine, but many of us fail to take that advice into consideration. And so, as working days go by, we are left with back pains, spine problems and sore necks. As you may have noticed, the lower part of your spine is naturally curved inwards. This means that every time you sit down, there will be a gap between your back and the back rest of your chair. Having good lumbar support means filling in this gap in order to have a decent posture. Failing to do so will lead to long-term issues, like lumbar muscles getting weaker. 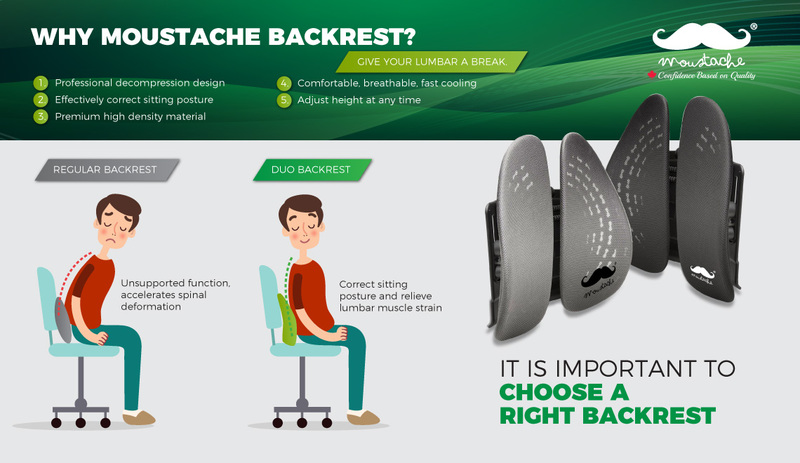 This Moustache Ergonomic gaming chair comes with a lumbar pillow that will help correct this posture. Additionally, it provides telescopic foot rest, a headrest pillow that will avoid strain on your neck and also height adjustment, so you can adapt your position to match the height of your desk. The Moustache Ergonomic Office Chair is another good choice, as it is made of bonded leather and provides 3 levels of adjustable lumbar support. In addition, you can adjust the tilt level and lock it down thanks to the integrated mechanism. The arm rests are also made of bonded leather, providing enough support for long hours of typing and writing. Underneath the chair, you will find a pneumatic lever to adjust the height, making it easy to fit this chair with any desk. Although it brings a wide array of features to the table, the design is pretty basic, thus allowing you to match it to almost any room theme. When it comes to office chairs with good lumbar support, nothing does the trick better than a gaming one. Gaming chairs were especially designed for people who spend 10+ hours in front of the computer, so comfort and good body support is the main thing that manufacturers of this product have in mind. This Ergonomic Racing Gaming Chair is an example of a product with good lumbar support. The waist pad can easily be moved around to fill the gap created in your lumbar area and the neck pillow aids in the comfortable positioning of your head as you’re sitting at the PC/laptop for hours. The thick padding of this chair focuses on your pressure points as you sit on it, avoiding that sore buttocks syndrome that most of us get when we basically live in front of our desks. As a conclusion, if you spend more than 4-5 hours per day at your desk, investing in a chair with decent back rest is a must for the long term health of your body.